10-16 Passenger Suv Ford Excursion Limousine Is Offered In All White OR Black/White (2 Tone) Colors. such limo is the Ford Excursion SUV. This SUV was launched in the year 2011 and is the largest SUV that has been manufactured by Ford till today. It also has a stylish option to having to buy a van to accommodate your storage needs as well as your towing needs. However the Ford Excursion SUV will also be off road ready which is something that vans do not promise. The Ford Excursion SUV will be able to accommodate 10-16 passengers which is an amazing number of passengers in an SUV segment. 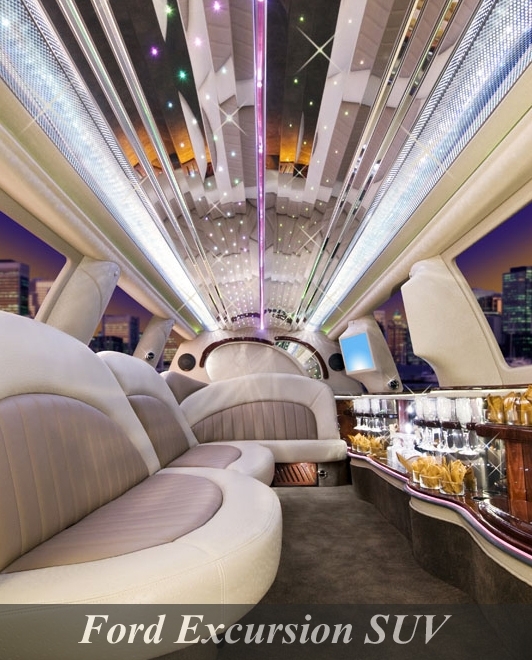 Equipped with Leather seats, Mood Lights, Fiber optic lights & Star Gazer Ceiling. Premium sound system with Aux Hook up. 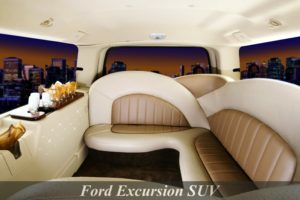 The Ford Excursion SUV Limousine is also equipped with Wood grain bar with led lights & Stainless steel Champagne buckets. There are various optional features that the Ford Excursion SUV offers consumers including a rear DVD system that will come in especially handy for those who have children. A reverse sensor system that is nice to have given the sheer size of the Excursion SUV. One more option is to have power adjusted foot pedals that are nice for those that are smaller than average people. You can even choose a six CD changer in the dashboard and the option to have captain seats or bucket seats installed in the second row of seating instead of the usual bench seating style. 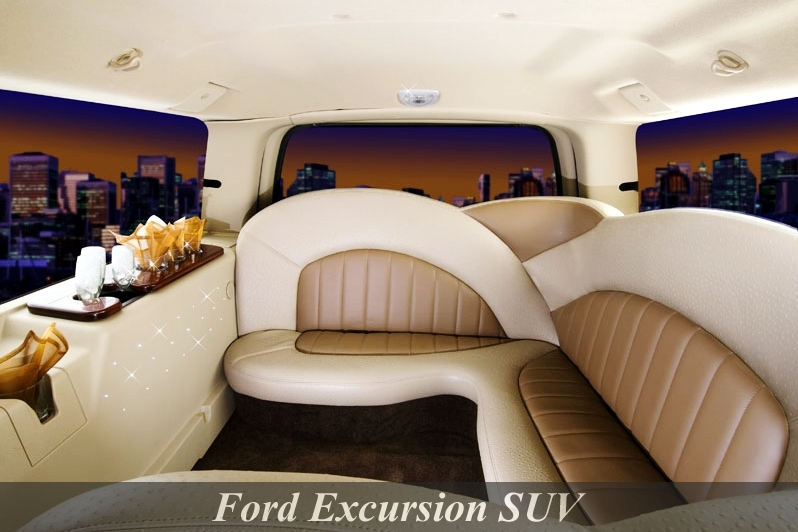 There are four models in the Ford Excursion SUV. The first is the XLS model and is the basic model that includes air conditioning a cruise a front bench seat that will accommodate 10-16 passengers in the vehicle as well as the other various standards. The second is the XLT version which will add a few adjustments to the XLS model which include automatic lights and aluminum wheels and rear audio controls and a trip computer as well. This XLT model will also include two captain seats in the front instead of the bench seats. 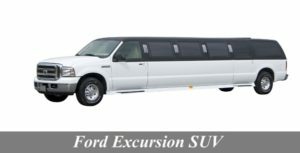 The Ford Excursion SUV Limousine will also be available in an Eddie Bauer model and the Limited model. The former model will include tan trim and fog lights and turn signals on the side mirrors along with automatic climate control as an inclusion. The later model will be noticeable by the body and trim color that are slightly different than the other models as it will also include a premium audio system the heated front seats and a reversible cargo mat as well. Those looking for space during those long trips or because they need the extra room for hauling people or pets Ford Excursion SUV is going to be a great vehicle for you. It offers many things that other brands cannot compete at all.